A woman caress a future pot skillfully with her muddy hand, or other Lombok pottery stuffs that are having in drying process are view that you will see in Banyumulek village. This village is one of pottery centres in Lombok island. In Banyumulek village, making pottery is a job that has been done for sasak Lombok tribe for generations. The job has been able to move the village economic wheel and attract many visitors and buyers to come to this village. 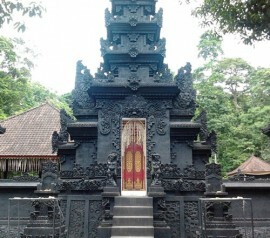 When you’re entering Banyumulek village, you will be welcomed by a green gate which says ‘Banyumulek, Pottery Centre’. Even the school and local government offices are decorated by huge potteries in the gate fence. These decorations strengthen even more that Banyumulek is a pottery centre. 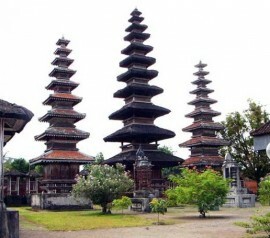 Along the street, many Lombok galleries can be found in right and left side of it. 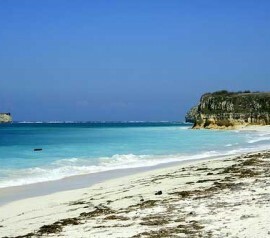 All you have to do is just choose which one you want to visit. 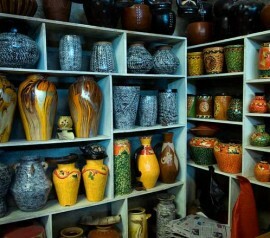 Amongst them, there is a major gallery you can find, where your eye will be spoiled by the various kinds of Lombok pottery with various shapes, size, color, functions, and uniqueness. 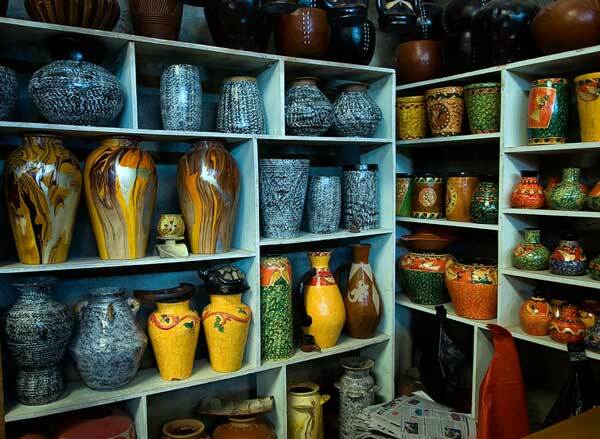 Some of them are egg-shaped earthen pot, sand flower vase, sand flat vase, chicken-shaped bank, jar, lampshade, and various of wall decorations in many size. 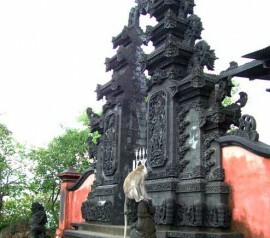 According to a local people, the special stuff of the village is the thief kettle (kendi maling). In Indonesian, maling means thief. The name thief was given because to fill the kettle, you have to do it from a hole in the kettle’s bottom, like a thief who never takes a normal way. Even if the hole is in the kettle’s bottom, the water will not come out if the kettle is put like any other kettle. The kettle has been perfectly designed so the water will not come out from the bottom hole. 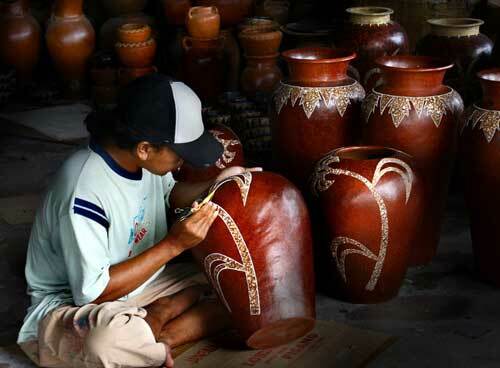 The marketing of Banyumulek pottery products has been reach international market such as New Zealand and Europe. The price offered is vary, from IDR 15,000- IDR 500,000/ pc depend on the size, motif, and the making complexity. 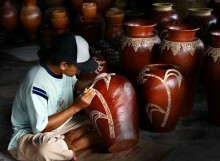 Besides enjoying the colorful Lombok pottery, you could also see the making process. When you watch the making of it, you will get surprised because craftsmen never use any measurement tool to measure a diameter of pottery they’re making. All of it is done with heart. Only by using simple tools and clay, the craftsmen in this village are able to produce such magnificent, useful product. 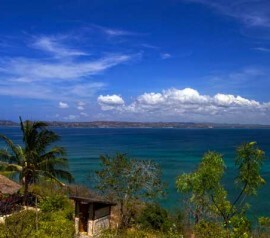 The creative industry of Banyumulek cannot be separated from natural support around the Lombok village. In this village, there are many clays and water as materials to make pottery. For the colorant, they use natural colorant such as cooked tamarind grain. Nevertheless, they also use synthetic colorants which are bought from surrounding areas. 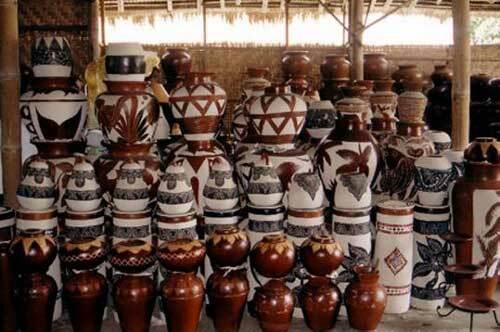 Also mentioned: banyumulek pottery village, banyumulek lombok travel, lombok islands pottery, banyumulek village. Bring cash money as much as needed, because ATM location is quite far from this village and sellers only take cash money no credit card. Be careful when you’re seeing pottery stuffs, if you break it, you have to pay for it. Public Facilities: public toilet, gallery and small mosque.